[pdf document, U.S. Congressman Jerrold Nadler, April 12, 2002]. This report alleges that the EPA misled the public about the hazards of lower Manhattan's air quality and that testing of indoor air quality has been inadequate. It calls on the EPA to systematically and properly test and remediate all downtown buildings affected by the World Trade Center tragedy, using properly trained personnel and the best-available equipment and methods tied to genuine, established health-based standards. 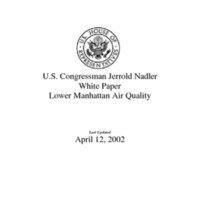 “Revised Version of White Paper on Lower Manhattan Air Quality,” September 11 Digital Archive, accessed April 19, 2019, http://911digitalarchive.org/items/show/2883.